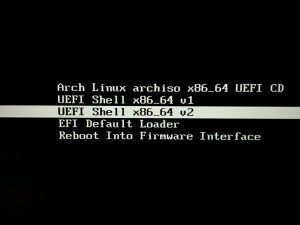 Update your UEFI Firmware under Linux can be a little challenge. This article provides information regarding the Thinkpad T450s and the recent UEFI version 1.21. Important: I am not responsible for any hardware defects – using this information is your own risk. After you downloaded everything necessary make at first the geteltorito script executable. Then use geteltorito to extract the content from the .iso file. Then mount the new generated bios.iso file. 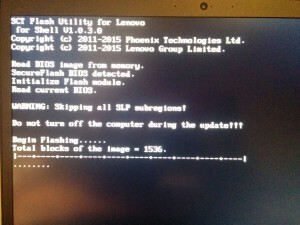 Copy the necessary files from the mounted bios.iso in your UEFI partition. After that your system is prepared to flash the actual firmware. 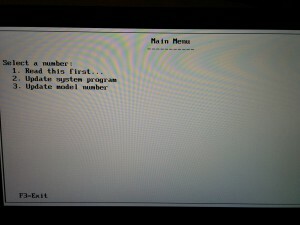 Boot from your Arch Linux USB-Stick and choose the boot option “UEFI Shell x86_64 v2”. Once you are in the UEFI Shell change to the appropriate EFI partition. In my case it was fs1. Wait until the Main Menu appears and select number 2 to update the system program. Now your machine will flash the firmware. After a reboot you will also see a progress bar. Wait until the flash process is finished. Congratulations, your system should be up to date.